I did a small juice fast the other day, and this immune boosting juice was one that I made during that juice fast. You may think, wait a minute. Juice a sweet potato? Trust me. They make for some yummy juice. Sweet potatoes are also loaded with Vitamin B6 and Vitamin A. The yellow pepper adds another level of sweetness while boosting your immunity. Yellow peppers are also high in Vitamin C. If you are interested in the type of juicer I use, you can see it here . This was my most favorite juice during the whole fast. It reminded me of my Detox Juice without all the fruit. 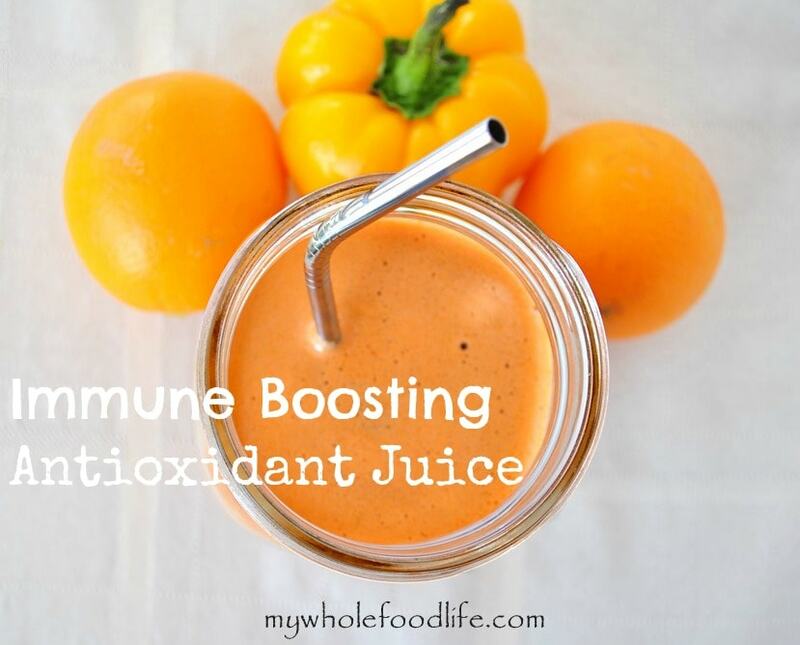 There are so many good ingredients in this Immune Boosting Juice. Sweet potatoes help protect against cancer. Apples are high in antioxidants which makes them great for preventing cancer as well. Apples can also lower your risk for stroke. Chard is an excellent source of vitamins K, A and C. Chard is also a good plant based source of iron. Celery reduces inflammation, lowers blood pressure and is a great source of fiber. Carrots are high in antioxidants as well. Lemons are great for cleansing and can help with digestion. Cucumbers rehydrate the body naturally. In other words, this juice is packed with some really good stuff! This looks so delicious, I've been really craving fresh juices lately after the holidays! I haven't juiced sweet potato before, so this will be a good reason to branch out from carrots! I've never put pepper in juice or smoothie. Sounds really interesting! I'd love to try this! Me either! It was my first time and it was so good! This looks like what I need right now. You actually use a raw sweet potato? Yep! I swear it's so good. I don't have a juicer....and do not have the money to purchase one right now. Any other suggestions?? Can this be made in a VitaMix blender? What kind of liquid you recommend, I think I would need to add a little liquid in the VitaMix? It might be able to. You will need to strain the mixture afterward. You also might have to do this in batches since all the veggies will probably not fit into the vitamix at once. If you add liquid, you can add water. Hey Melissa - what kind of juicer do you have? Both my hubby & I are feeling icky, can't wait to give this a try. Oh I can't wait to try it! How often would you drink it? Weekly? Thanks so much for recipe! I would drink it once a week. It's a really yummy juice. I just made this! I don't have a juicer so I used my blender and strained it through my nut bag. There's so many "ickys" going around that I want to build up my immunities naturally. Thanks for the fast and easy recipe! Will spinach provide the same immune boosting value as chard? The recipe isn't here. I just got a juicer and was so excited to try this. The recipe isn't here. I just got a juicer and I was so excited to try this. Hi Melissa, Is there any way you can re-post the recipe again as the glitch was never repaired. It would be wonderful if the recipe could be available again. Thank you!